As you set up phones for use in PureCloud, you specify the provisioning URL to point to the PureCloud global phone provisioning service. Phone provisioning is a process that simplifies the configuration of phones by directing a phone to connect to an HTTP web service to receive unique device configuration settings. When you use the global phone provisioning service, the phone is directed to a highly available cloud service instead of being directed to a specific Edge device for provisioning information. More specifically, the service accepts the provisioning request and then determines and directs the phone to the best Edge device to handle the request. There are three options you can use to configure the provisioning URL for your phones. The rest of this article describes these options. In addition to the instructions below, you must configure additional base settings to point to the provisioning service and to specify the phone's MAC address in the phone settings. For more information about the required configuration, see Configure base settings for phones under PureCloud Voice and Configure the phone settings. PureCloud Voice requires secure phone provisioning with HTTPS. In PureCloud, you must configure the phone's base settings to provision securely over HTTPS. However, you configure the physical phones to connect to an HTTP endpoint on the first request. After the initial request, the global phone provisioning server redirects the phone to provision securely over HTTPS. This is required to support some phone models. This option is recommended for small to medium-sized organizations and may require some network setup. PureCloud provides direct support for the Polycom Zero Touch Provisioning (ZTP) feature, which allows Polycom phones that meet all of the ZTP requirements to automatically locate the PureCloud global phone provisioning service without any manual configuration. For more information, see Polycom Zero Touch Provisioning requirements. When you create a base settings configuration and choose a Polycom phone template, PureCloud automatically notifies Polycom’s ZTP service. If the Polycom phone is ZTP-compatible and meets all of the ZTP requirements, when the phone boots up for the first time it will automatically connect to the ZTP service and access the appropriate phone provisioning endpoint for your region. This option is recommended for medium to large-sized organizations and requires some network and server setup. 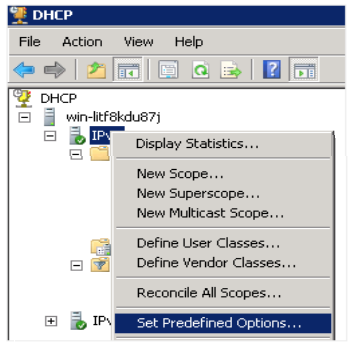 On the DHCP server, in the DHCP server tree, right-click the appropriate IP version node, and then select Set Predefined Options from the shortcut menu. 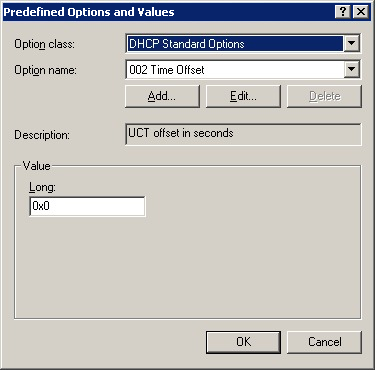 When the Predefined Options and Values dialog box appears, select DHCP Standard Options from the Option class list, and then click Add. In the Option Type dialog box, enter descriptive text in the Name and Description fields, select String from the Data type list, type 160 in the Code field, and then click OK. 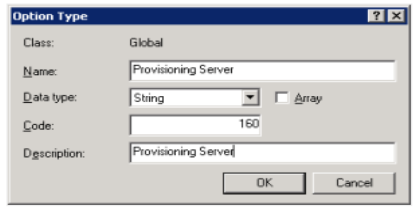 In the Predefined Options and Values dialog box, enter the appropriate phone provisioning endpoint address for your region in the String field. This option is recommended only for troubleshooting and requires you to enter information on each phone. Using the phone's menu system, navigate to Settings > Advanced > Administration Settings > Network Configuration > Provisioning Server. 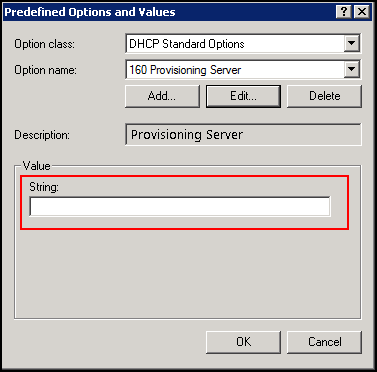 From the Provisioning Server menu, select the DHCP menu and set the Boot Server to Static. Go back to the Provisioning Server menu. Note: These settings may differ slightly depending on your phone model. If you have difficulties finding the appropriate menu options, check the phone manufacturer's website for more information. Manually configure the provisioning information for the Polycom VVX phone. Manually configure the provisioning information for the Polycom SoundPoint IP phone.